This Mexican-inspired chicken recipe combines the best of American cooking with a delicious traditional Mexican green chile sauce and cheese. Not only is it easy to prepare; it's also healthy: low-carb, low-fat, and low-calorie—yet bursting with flavor! A recipe for homemade green chile sauce is given, but 3 1/2 cups/830 ml canned can be used instead. 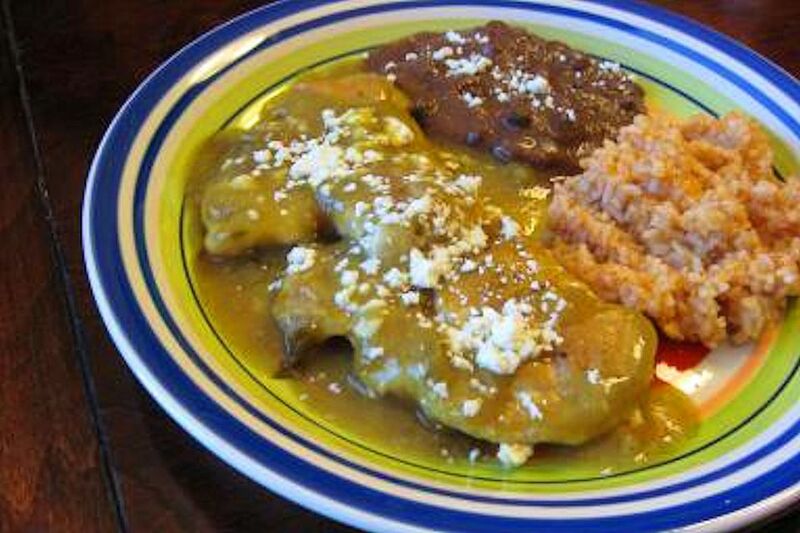 While the chicken breast in this dish is baked in the oven, ​most cooks in Mexico do not use their ovens often. Oven-baked dishes are usually considered a special party or holiday fare. In fact, stove ovens are frequently used as storage space for pots and pans! Roast the peppers, peel them and remove and discard the stems and seeds. Blend chile flesh in a food processor or blender until chunky. Add water, peeled garlic, oil, lime juice, salt, and optional cumin. Process until smooth. If you would like a spicier sauce, include 1 or 2 seeded jalapeño peppers. You will use this entire batch for this recipe but if you don't use it immediately, it can be refrigerated for a few days or frozen for up to 6 months. Rinse the chicken and pat it dry with paper towels. Place it on the bottom of a 13x9-inch baking dish. Pour the sauce over the chicken. Bake for about 35 to 45 minutes or until the center of the thickest part of the chicken breast has reached 165 F.
Remove the dish from the oven and crumble the cheese over the chicken. Serve immediately, with hot corn tortillas and Mexican rice and/or beans, if desired. For a change of pace, use chunks of pork in place of the chicken. To add eye appeal as well as flavor and texture, garnish your chicken with a mixture of diced raw onion and finely chopped cilantro. Add a drizzle of liquid cream (Mexican crema). Sprinkle it with shredded cheese (a kind that melts nicely, such as Mexican manchego, Oaxaca, or Chihuahua cheese) instead of the grated/crumbled cheese mentioned in the main recipe. Put your cheese-topped chicken under the broiler briefly, until cheese has melted and is just starting to brown.